585 Chain Drive Camshaft Kit, S&S, FREE SHIPPING! 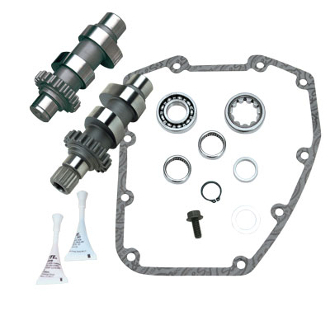 Our Products >> 585 Chain Drive Camshaft Kit, S&S, FREE SHIPPING! 585 cams are bolt-in cams for 2005-up engines. Cams that exceed the limits of the stock valve springs require the use of special high lift springs. Most S&S cams have higher lift than stock and are designed to take advantage of the extra flow of ported stock heads or S&S Super Stock® heads. Due to the high lift of these cams, S&S adjustable pushrods are recommended. Not all grinds are available in the chain drive version. To get the best performance from a performance cam installation, a high flow intake and exhaust system is also recommended. Designed for 88 to 96 CID engines with compression ratios from 9:1 to 10:1 and 100 to 111 CID engines from 9.7:1 to 10.5:1 compression. Provides massive horsepower and torque increases starting at 3000rpm and holds steady all the way to redline. 3500-6000 rpm for 88" - 96" engines and 2500-5500 for larger engines. 2005-'06 can use stock valve springs while 1999-'04 will need special valve springs.